If you want maximum control over organizing your programs and windows, check out Dexpot (free). This full-featured utility allows for distributing your running programs among distinct virtual desktops. A virtual desktop looks the same as your Windows desktop, but a given program will only show up on a particular desktop. So you can tuck away your IM and e-mail programs into desktop #3, for instance, and stay focused on your work in desktop #1. Clear the clutter with Dexpot's nicely organized virtual desktops. Dexpot 1.5.7 offers a wealth of options for flipping between desktops, including a configurable hotkey (Alt and the desktop number by default), and an option to switch desktops if you keep your mouse at the edge of the screen. There's also a desktop switcher that displays previews of each desktop with its currently open windows, and a handy task switcher that lists all the running apps on all your desktops. While Dexpot starts out simple, the wily window wrangler allows for some heavy customization. For example, you can create rules that will always move a particular program to a particular desktop when it's opened, or have Dexpot automatically open apps in a certain desktop when Dexpot starts up. You can also choose to have each desktop display its own background and icons (by default they all look the same). For some added effects you can enable some included eye-candy plugins, such as one that adds 3D animations when you switch desktops, or another that displays downloaded wallpaper clocks. A SevenDex plugin (also included with the app, but like all such plugins, dormant until you enable it) adds a Dexpot button to the Windows 7 taskbar for easy access to desktop previews. If you need help with a cluttered and distracting slew of open apps, virtual desktops could be a big help. 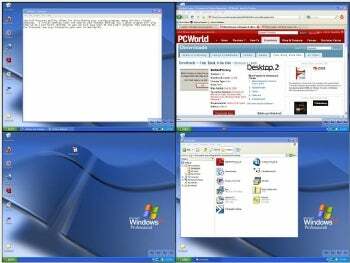 Windows XP users can also check out the Microsoft Virtual Desktop Manager, but Dexpot has more features (and also works on other Windows versions). Dexpot is free for personal use, and costs between 19 and 17 Euros per commercial license.